Winner Richard Start (right) receives his trophy. 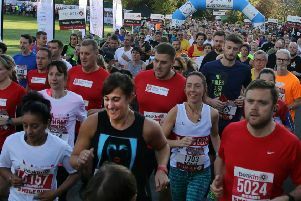 Start romped to victory in the Clowne Half-Marathon by fully two minutes, in a time of one hour, 14.09 minutes, and no fewer than 45 other runners from the club were among the finishers. Archivists at the club believe Start’s time is the fastest in a half-marathon by an NDRC runner in the last ten years, eclipsing the terrific 1.14.18 clocked by Chris Adams in the Blackpool North-West Half-Marathon in February 2017. There were many other impressive performances at Clowne, including from Ash Crow, whose time of 1.23.44 in 17th spot represented close to five minutes of improvement on his effort in the same race last year. 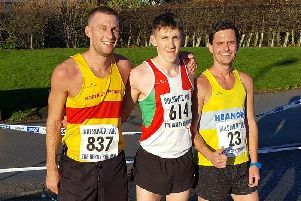 Richard Corker (70th in 1.34.04), Paul Boden (125th in 1.39.48), John Boardman (136th in 1.40.22) and Chris Hunt (176th in 1.43.08) all ran near to, or better than, their recent half-marathon marks. The ladies enjoyed a fruitful morning too, especially Sam Iliffe, who was the third lady home and 42nd overall in a time of 1.29.47. Emma Holt was the ninth lady home in 1.35.29 and Hannah Barnett 14th lady in 1.38.33, all of which earned the ladies’ team prize for NDRC. Lynne Delaney, Sarah Witham, Sarah Johnson, Louisa Ashley and Julie Cooper were also well chuffed with times in and around the mid-1.40s, while Fiona Duroe recorded a tremendous time for an over-55 veteran of one hour, 56 minutes.